When I first came across the labyrinth, I thought how wonderful it would be to share it with others from all walks of life, including folk who normally find they are marginalised from society. I already had quite a few friends and contacts in the homeless community through my work as a community musician. I was lucky to find a friend at the Cambridge University Botanic Garden who shared my vision, and we set to work turning our idea into reality. So finally it came to pass, on a very warm Wednesday in August 2012, that a group of homeless and ex-homeless people came as guests to the wonderful green space known as the University of Cambridge Botanic Garden, with the aim of creating and walking a labyrinth, and of spending time enjoying the garden setting. 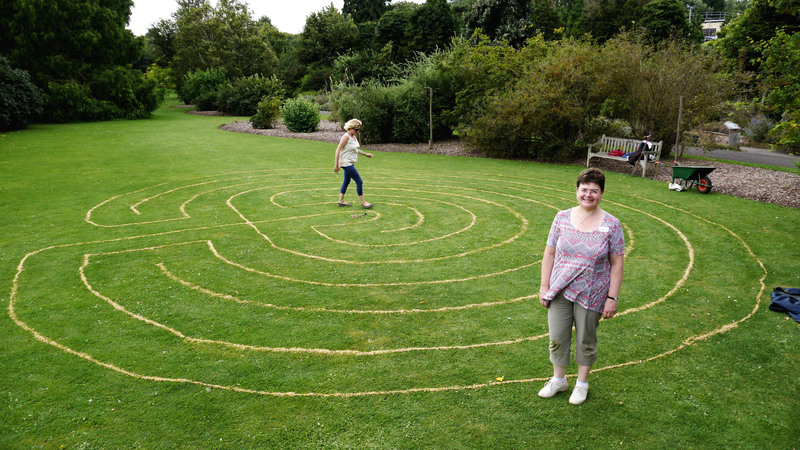 Our mission was to create a temporary labyrinth, using one 20-kilo sack of mixed corn. This is a mix of bright yellow cracked maze and wheat, of the sort that is very desirable to chickens! The paths of the labyrinth would be edged by a curving trail of this grain, with each trail poured from the mouth of a recycled lemonade bottle. There is a certain skill to the grain pouring, which generally comes after a few spills and a certain amount of practice! The second skill to learn is that of following your mark on the guide rope as it sweeps round in an arc, fixed at one end to a swivel in the centre of the labyrinth, and held low to the ground at the other end by a slowly circling person – on this occasion by me, crawling on my hands and knees. The classical labyrinth form is a compelling shape, and as it began to appear, passers-by stopped to watch. Sometimes it seems to me that the labyrinth acts as a net, catching people and animals in its intriguing threads. Our visitors were welcomed in and invited to join us as companions in our walking. We especially admired the fleet footed running of Lucia! We hoped that many more visitors would walk our labyrinth before the squirrels, birds and mice of the garden nibbled the grains away and it slowly returned to green. • ‘returning’ as you wind your way out again, bringing with you whatever you have received. The labyrinth is a great place to receive artistic and poetic inspiration. So we set to work with paper, pens, pastels and crayons to record in some way what we had received and felt in the garden. I also placed a small heap of ripe hazelnuts at the centre of the labyrinth for people to pick up as a keepsake. This seemed appropriate, as the hazelnut is an ancient Celtic symbol of wisdom. 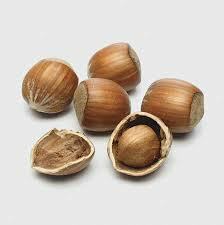 The hazelnut is also meaningful in the Christian tradition. The medieval mystic, Julian of Norwich, had a vision in which she saw ‘everything that is’, small as a hazelnut, yet held safely in the palm of God’s hand. The hazel nuts seemed fitting to take away as a keepsake to remind us of our experience, and I imagine the squirrels were very pleased with the leftovers. Best of all, EVERYONE who came had some positive thought or inspiration to take away from the day. That is truly the gift of the labyrinth, and I was glad to be there to see it happen.